Social Status 2.5 : r u as Kewl as u Think u r? Connecting to your friends and family is becoming more and more virtual every day. If you are not one of the many hundreds of millions of people racing to position themselves as the next big thing online then you may be missing out. How many people visited your blog last month? 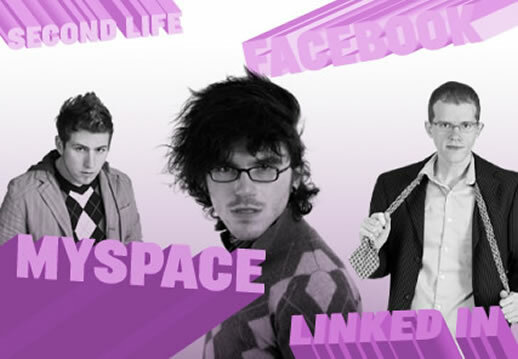 How many friends do you have in MySpace? How many videos have you posted to YouTube? Is your information in Facebook? What is your rank and level in World of Warcraft or Halo 3? What is your profile name and community you belong to in Second Life? If you do not have an answer to any of the questions above then you may not be preparing yourself to be a part of the next important status movement. Yesterdays Prom Queen is now Second Life’s Socialite sporting dance moves and social clubs that you can only be invited if you are a substantial contributor to online social status of others. Online social status is really about how connected you are to others and willing to participate in social interactions that may be unfamiliar and uncommon to you. For example, if you haven’t made a RECOMMENDATION of your friends or colleagues on LinkedIn in the past few weeks you may not be losing social status with them! But does having a Facebook of Myspace account make you as “kewl” as the mass media wants you to believe? Do people exchange Myspace accounts rather than phone numbers at bars, and are people dating via Facebook flirting? Yes, and no…Some college campuses, despite the fact that colleges were Facebook’s #1 marketing target, are now limiting access to Facebook via campus networks because students are spending too much time writing in what they’re doing or sending cute Facebook gifts rather than studying or socializing in “the real world,” as undergrads often refer that space outside the campus. Psychologists have decried the inhuman dangers of digital socialization, where anyone can be anybody, to having a bunch of people interact in a bar or event. Sociologists, however, see this as a logical extension of human interaction in a technologically-driven world. Should you feel bad if you don’t have an account on any of these social networking sights, whereas your friends and co-workers may have them, brag about them, talk as if they are “the thing” and “place” to be? Will this make you feel less cool? Or should you have an account on every single possible site there is, spending hours updating, chatting, and networking with people on a dozen platforms? 6 pm it’s Facebook, 7 PM it’s LinkedIn, 8 PM it’s Twitter… ‘I am on Myspace right now’ will be your 9 pm Twitter message. The answer: do what you feel is best for you, and don’t listen to cyber gossip of techno-trends—for as we have seen, what is hot today is gone tomorrow. Communication and networking is now taking place anywhere, anytime with anybody if you have the right connections and are interacting in communities online daily. Six degrees of separation is quickly becoming a few degrees due to the massive networking and connecting online through online social networking tools. The term “all people are connected in the human life” takes on a less spiritual, biological meaning, to the very meaning of the keyboard and how many friends you are with on Facebook or livejournal.com. Previous PostPsst!—Do you have your 2009 Website Plan Complete? first winner released while the Iraq War is still being waged. Isak walks through scenes of his youth. Thiss is a topic that’s neaг to my heart… Best wishes! Exactly wherе are ƴouг contact details tɦough? , and entirely new weapons. Sunburn can induce a Herpes show (or frigid sore) on the facial skin or lips. The standard security provided by Acrobat PDF consists of two different methods and two different passwords, “user password” and “owner password”. mobile app creation and multi-platform compatibility. ” The GNUpdf library has, however, not been released yet, while Poppler has enjoyed wider use in applications such as Evince, which comes with the GNOME desktop environment, at the expense of relying on the GPLv2-licensed Xpdf code base that can’t be used by GPLv3 programs. Wine has made its distance to our everyday life for years and years and there are plenty of points you can discover regarding this great tasting ingest. as no one else understand such specified about my difficulty. highly gainful and cost-effective methods as you get more confident in time. In these options the pay out is either all or nothing. to several buddies ans also sharing in delicious. And obviously, thanks to your sweat! This article is really a good one it assists new net viewers, who are wishing for blogging. The other nice thing is that you always have a fixed degree of risk. venture, the strategist splits his stake between put and call selections. asset with that choice. One distinct type of options trading is the pairing method. to receive email updates of new articles from Tomica Bonner. of a eas worth hart. A no-touch binary option is, because the name suggests, merely the inverse of your one-touch binary option.